In the past, dental school curricula has contained very little on the subject of proximal contact adjustment. The adjustment of tight proximal contacts is critical to both patient comfort and the longevity of crowns. 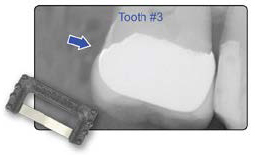 Using the ContacEZ Black Diamond Strip, dentists can easily achieve ideal proximal contact adjustment in-mouth, restoring Interproximal Relief and ensuring complete marginal seating. Fig. 1 An improperly seated crown due to overly tight proximal contacts. Crowns like this are often uncomfortable in the mouth and can cause a number of iatrogenic side effects, including the development of dental decay under the crown prematurely. Fig. 2By using the Black Diamond Strip, proximal contacts were adjusted and Interproximal Relief was restored on this crown on Tooth #3. This ensures that the patient will enjoy the immediate comfort, functionality, and long-lasting quality they deserve.